TRUE TO form, Al ‘‘Captain’’ Sabaupan didn’t disappoint his fellow Bicolanos as he scored a rousing TKO victory over gutsy Indon fighter Eddy Comaro last September 21 at the Sipocot Municipal Gym in Sipocot, Camarines Sur. With no less than Camsur Governor Migz Villafuerte and Saved by the Bell executives headed by Elmer Anuran in attendance, Sabaupan, proud son of Sipocot decked Comaro thrice in the fifth round to the thunderous applause of the crowd. Referee Ferdie Estrella stopped the fight. Egged on by the overflowing crowd, Sabaupan downed Comaro in the first round before a flurry of punches downed the Indon once in the third round. ‘‘It was a thunderous show for Sabaupan. He showed his power against an opponent, who was determined to finish the bout,’’ said Anuran, who was joined by SBB executives and brother Danny and Rod Nebiar in the boxing extravaganza. Anuran expressed his appreciation to the support of the Camsur provincial government headed by Gov. Villafuerte. ‘‘Boxing is growing in Camsur and the whole of Bicolandia because of Gov. Migz’s overwhelming support,’’ said Anuran, also owner of the Touch Gloves Boxing Gym in Agoncillo, Batangas. This was the third time that SBB held a boxing promotion in Camsur, which is known for its watersports complex. ‘‘Thank you to the Bicolanos for their warmth and support,’’ said Anuran. Sabaupan said he’s determined to score a knockout. ‘‘I want to thrill the fans. I want to make a powerful show infront of my provincemates and Gov. 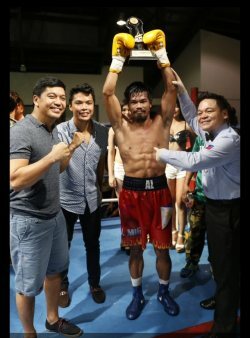 Migz,’’ said Sabaupan, who upped his record to 23-2-1, 18 KOs). Last March, Sabaupan became talk of the town as he floored gutsy Thai fighter Rachamongkol Sor Pleonchit in the 8th round. Two months later, Sabaupan returned at the Pili Capitol Convention Center to force the retirement of African Sadiki Momba.